That’s a wrap everyone! #bundleupyeg is officially done for another year and we far exceeded our original goal of 130 bags. Words can’t describe how grateful, happy and stunned I am at this year’s campaign, so I’ll share some numbers with you to try and break it down. 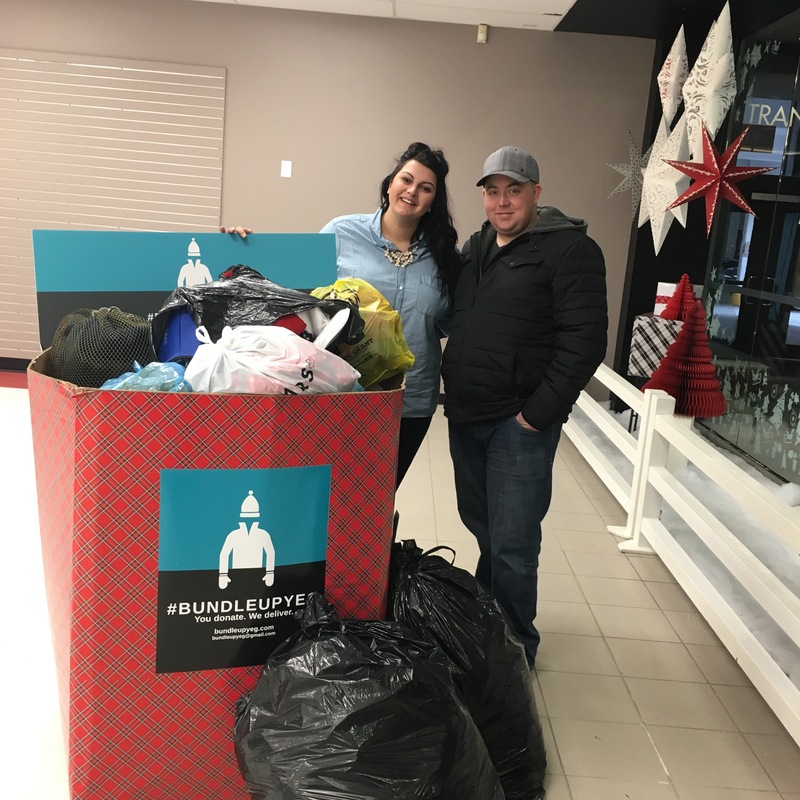 Between Nov.1 and Dec.24, our #bundleupyeg team of five people (myself, husband Ryan, parents Bill and Maria Franklin and friend Steve) collected 510 garbage bags and boxes full of clothing that were then personally delivered to Edmonton homeless shelters including Bissell Centre, Hope Mission, Boyle Street and Mustard Seed! To put this in perspective, between 2013 and 2015, #bundleupyeg collected 370 bags total. This means that in two months alone, we collected and delivered more donations than all three previous years of #bundleupyeg combined! When it comes down to it, numbers don’t mean much. What truly matters is why we do this — to keep people in need warm. So, if we average about 10 clothing items per bag (socks, shirts, jackets, mitts, hats, etc.) that means 5,000 clothing items (give or take a few) were delivered to our local shelters in eight weeks through #bundleupyeg. So many more that I probably have missed! Our local shelter staff are such incredible people and until you visit a shelter first-hand I don’t think anyone can truly understand what they do. Nichelle Bryant (pictured left), In-Kind Coordinator, Bissell Centre; Darren Brennan, Coordinator, Communications & Media Relations; Devin Komarniski, Interim Director, Resource Development; Erin Bonilla, Community Engagement Coordinator, Hope Mission; Brent Guidinger, Development Manager, Boyle Street Community Services; and Alyssa Kruysse, Personal Assistance Centre Supervisor, Mustard Seed Edmonton. Why did #bundleupyeg boom this year? You know that saying “it takes a village” — that was certainly the case in #bundleupyeg for 2016. For the past three years, we are lucky to have gotten help with pickups and deliveres when we needed it (thank you Colin! ), but for the most part, #bundleupyeg has been a two person job. I do all of the promotions and coordinating of pickups, deliveries, box locations, etc. and my husband and I do all of the pickups together. This year, we simply couldn’t have done it alone. Thanks to the enormous support from my parents who were available to do #bundleupyeg during the day, we were able to substantially exceed our goals and expectations this year. We also received help from our friend Steven Hawkins who played a huge role in helping us out, especially when our #bundleupyeg-mobile (our truck) decided to break down the last week of collections. CBC Radio’s Portia Clark, the Bissell Centre blog and Dinner TV for spreading the word of our initiative. On behalf of our entire team, thank you. Thank you Edmonton for bringing #bundleupyeg to life and embracing this initiative. Thank you to every single person who donated — whether it was one bag or 15 bags, your donations make a difference in the lives of those who need it. Four years ago, I would have never imaged my small idea would turn into this. I am forever grateful for everything this has become and for those who have helped get us here. Here’s to 2017 and seeing what we can achieve next year! Merry Christmas, everyone. We send you all our love.